Plot Summary: Two years after suffering defeat at the hands of the Gatchaman team, Sosai X returns to Earth and crashes into an ocean liner. During the crash, he takes a four-year-old girl aboard the ship and mutates her into GelSadora, making her the new Gallactor leader. With Gallactor back on the rise, Dr. Nanbu and the ISO bring the Science Ninja Team Gatchaman back into active duty. But the Gatchaman team get the shock of their lives when their former teammate Joe the Condor - once thought to be dead after the team's final battle with Gallactor - returns as a cyborg. 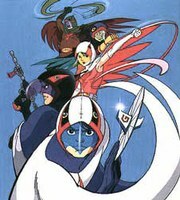 In 1996, Saban Entertainment licensed Kagaku Ninjatai Gatchaman II and Gatchaman Fighter, and combined both titles into the 65-episode series Eagle Riders. Only 13 episodes aired in the U.S., while Europe and Australia aired all 65 episodes.